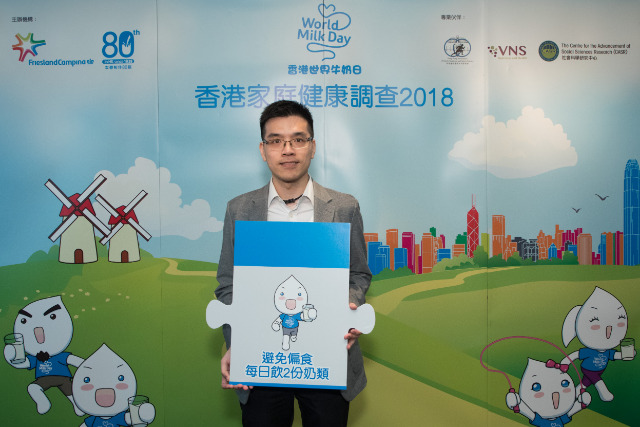 (31 May 2018, Hong Kong) Since 2001, 1 June has been “World Milk Day,” a day on which the Food and Agriculture Organization of the United Nations (“FAO”) promotes the goodness of milk. 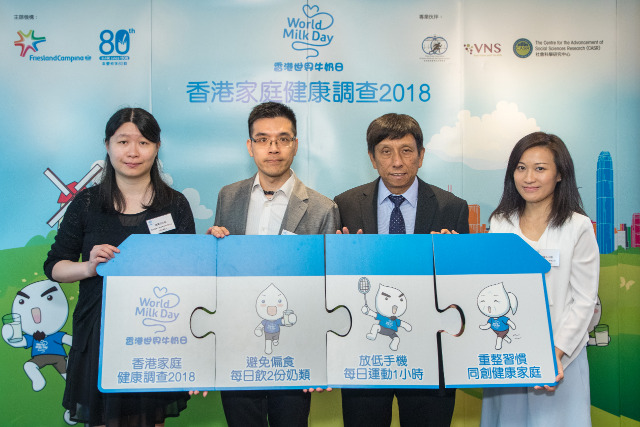 In this connection, FrieslandCampina (Hong Kong) Limited (“FCHK”) commissioned the Hong Kong Baptist University Centre for the Advancement of Social Sciences Research to conduct “Hong Kong Family Health Survey” (“the survey”) for Hong Kong World Milk Day 2018. A total of 429 respondents between the ages of 21 and 70 were surveyed to study the diet and exercise habits of their children, themselves and elders at home, including their daily dietary and dairy intake, exercise habits and number of hours they used electronic devices for leisure. Objective of the survey is to help establishing healthy lifestyles by raising awareness among Hong Kong families on balanced nutrition and moderate exercise for family members of different age groups. (From left to right) Ms. Channey Chan, Project Coordinator of Centre for the Advancement of Social Sciences Research at Hong Kong Baptist University, Dr. Lobo H.T. Louie, Associate Professor of the Department of Physical Education at Hong Kong Baptist University and President of the Hong Kong Association of Sports Medicine and Sports Science, Mr. Samson Chim, Chief Dietitian at VNS Nutrition and Health Centre and Ms. Natalie Yuen, Associate Director, Corporate Affairs of FrieslandCampina (Hong Kong) Limited hope to raise awareness among Hong Kong families on balanced nutrition and moderate exercise for family members of different age groups to establish healthy lifestyles, by sharing results of the survey and related suggestions at Hong Kong World Milk Day 2018 “Hong Kong Family Health Survey” Announcement. The survey investigated the daily dietary habits of respondents, including their dairy intake and level of picky eating. The survey result unveils that picky eating was a cause of concern across respondents of different age groups, with about half of parent respondents (46%) believing that their children were picky eaters and more than one-third of the those (36.5%) admitting that they are also picky eater, which was a higher percentage than elderly respondents (31.0%). 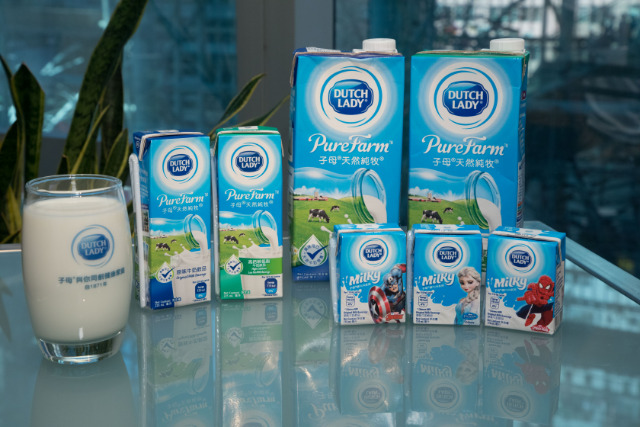 The Hong Kong Department of Health recommends that children and teenagers aged 2 to 17 should have two servings of milk and alternatives (“milk”) daily, while adults and elderly should have one to two servings of milk daily. Given the milk intake of the respondents, more than ninety percent of parent respondents (91%) and almost all of their children (99.5%) did not meet the recommended milk intake on weekly basis. Although more than seventy percent of the elderly respondents (77.2%) expressed their preference for milk, and more than half of them (50.2%) agreed that they needed to increase their milk intake. However, according to the survey, nearly ninety percent of elderly respondents (85.6%) drank less than six cups of milk per week, which was below the Hong Kong Department of Health’s recommendation of one to two servings per day. The survey also found that misconceptions about milk are common across all respondents. About sixty percent of parent respondents (59.0%) thought that milk is unsuitable for people who were lactose intolerant. Among respondents who believed they do not need to increase milk intake, about sixty percent of elderly respondents (57.9%) believed nutrient from milk is replaceable by other foods and more than thirty percent of parent respondents (32.1%) believed milk can cause fat. Also, more than thirty percent of parent respondents (32.5%) thought that milk is for supplement of calcium only, and about twenty percent of parent respondents (19%) believed milk is only suitable for children and the elderly. Mr. Samson Chim, Chief Dietitian at VNS Nutrition and Health Centre, expressed concern about the results of the survey, “In the food pyramid, milk is placed as a separate food category to emphasise their irreplaceable importance. Many nutrients contained in milk, including proteins, calcium, phosphorus, and Vitamin A, etc., cannot be produced inside the human body, must be ingested from food, and are very important for cell growth, muscle development, vision, and healthy bones and teeth at all stages of life.” Taking bone development as an example, according to the International Osteoporosis Foundation (IOF), childhood is a person’s peak bone producing years, in addition to adequate ingestion of calcium and Vitamin D, adequate dietary protein is essential for optimal bone mass gain during childhood and adolescence. It also helps to preserve bone mass with aging. Milk is one of the excellent sources of protein. As for adults and the elderly, bone mass can keep growing until around age 30, when bones are reaching its maximum strength and density. After this point, the amount of bone in the skeleton typically begins to decline slowly as removal of old bone exceeds formation of new bone. To maintain bone health, adequate Vitamin D intake is essential and can help preventing osteoporosis. The World Health Organisation (WHO) has pointed out that overweight and obese children are more likely to stay obese into adulthood and to develop non-communicable diseases (NCDs) like diabetes and cardiovascular diseases at a younger age. At least 2.6 million people die each year as a result of being overweight or obese. However, according to the statistics of Centre for Health Protection, the Department of Health, HKSAR, as of school year 2016/17, overall overweight and obesity detection rate of primary school students of Hong Kong accounted for 17.6%. The WHO recommends that children and adolescents aged 5-17 should do at least 60 minutes of moderate to vigorous-intensity physical activity dailyto maintain their health. However, the results of the survey indicate that, according to the parent respondents, other than the 80-minute physical education class at school each week, their children only did 66 minutes of exercise per week on average, which meant that the actual amount of exercise was nearly seventy percent (65.2%)lower than the WHO’s recommendation. More than half of parent respondents (55%) believed that their children did not exercise enough, and eighty percent (80.6%) believed that this was due to their children having too much homework. Among the variety of exercise, children spent time on “running” type sports the most, accounting for about eighty percent (78.4%), which was far higher than “jumping” type sports. “Throwing” type sports accounted for the lowest percentage. In addition, the WHO also recommends that adults aged 18-64 should do at least 150 minutes of moderate-intensity physical activity throughout the week, or do at least 75 minutes of vigorous-intensity physical activity throughout the week. The survey results indicate that parent respondents did 65 minutes of exercise per week on average, which was nearly sixty percent (56.7%) lower than the amount of exercise recommended by the WHO. At the same time, more than seventy percent of parent respondents (73.5%) responded a busy lifestyle as the reason for the insufficient exercise time, and nearly seventy-five percent of the respondents (74.7%) claimed that they had more time to exercise after their retirement. The survey result also showed extreme differences in the amounts of time that parent respondents and their children spent on static activities and exercise. Nearly fifty percent (49.5%) of parent respondents (69%) indicated that their children spent more than three hours a day using electronic devices for leisure, reaching an average of 26 hours per week, which was 23 timesmore than the amount of time they spent on exercise. Nearly sixty percent (58.6%) of parent respondents even said that their children showed feeling down after using electronic devices for leisure and nearly 70% (69.8%) of them observed that their children were tired. Among parent respondents, the average time spent on exercise was 64.8 minutes per week, but the time spent on using electronic devices for leisure was nearly 48 hours per week, which was 44 times. Among the elderly respondents, those with exercise more than 60 minutes per week on average reported a fall rate in the past five years at about twenty four percent (24.2%), whiles the fall rate of elderly who did not have the same exercise habits at about thirty six percent (36.6%). The health issues that the elderly respondents were most concerned about were “bones/ joints/ muscles” (36.3%), “Heart/ blood pressure” (35.1%) and “cognitive/ memory” (28.5%). More than ninety percent (90.1%) of respondents agreed that exercise can help improving balance and strengthen muscles. Dr. Louie added, “Exercise is effective in increasing bone density in people of all ages. The survey reveals that Hong Kong people spend a lot of time on electronic devices for leisure every day. Nowadays, with the popularisation of electronic devices, and to address the trend towards mobile phone addiction, we should increase the level of moderate exercise, and exercise our neck and shoulder muscles. If electronic devices are properly used in conjunction with exercise, it might help making exercise more fun. Moderate exercise could help preventing the elderly from falling. According to WHO, older people have the highest risk of death or serious injury arising from a fall and the risk increases with age. For example, in the United States of America, 20–30% of older people who fall suffer moderate to severe injuries. It is recommended that the elderly do more exercise to improve their balance for fall prevention." Exercise can help strengthening parent-child interaction and family relationships. When parents are having exercise together with their children, the happiness index of both parties are increased and therefore it is mutual beneficial to both parties. The survey found that seventy percent (70.0%) of parent respondents agreed that exercise helps children to develop social skills, communication skills and discipline. Among thirty percent of parent respondents who had exercise with their children, more than sixty percent (62.5%) of those exercised with their children at least once per week and scored an average happiness index of 7.3 points (out of a maximum of 10 points). To conclude, parent’s participation and their attitude play a key role in building strong family. As the decision-makers at home, parents should revise their own dietary habits, reference recommendation by the Hong Kong Department of Health taking one serving of milk per day so as to set a good example for their children. At the same time, they should encourage their children and make arrangements to help them achieving the recommended daily intake of two servings of milk for balanced nutrition and the establishment of a good foundation for health. Same for balancing out the time spend on electronic device for leisure and exercise. Parents should arrange outdoor activities for their kids and elder family members, which supports not only family bonding, but also physical and mental health of the entire family. Mr. Samson Chim, Chief Dietitian at VNS Nutrition and Health Centre indicated that milk is placed as a separate food category to emphasise their irreplaceable importance in the food pyramid. Many nutrients contained in milk are very important for cell growth, muscle development, vision, and healthy bones and teeth at all stages of life. 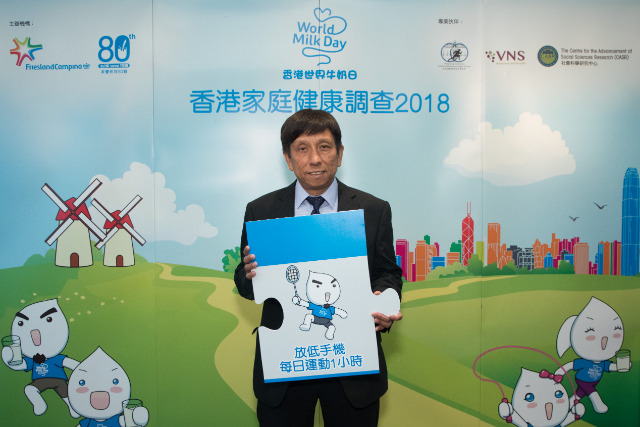 Hong Kong World Milk Day 2018 “Hong Kong Family Health Survey” revealed more than ninety percent of parents and their children do not meet the dairy intake recommended by Hong Kong Department of Health. Parent should revise their own dietary habits and take one serving of milk per day so as to set a good example for their children. At the same time, they should encourage their children and make arrangements to help them achieving the recommended daily intake of two servings of milk for balanced nutrition and the establishment of a good foundation for health. Electronic devices are defined as computers, smart phones and tablets. Using electronic devices for leisure refers to activities such as web browsing, online game, (browsing at) social media, live chat online, viewing online videos. The Food Pyramid – A Guide to a Balanced Diet, Centre for Health Protection, Department of Health HKSAR, Web. <http://www.cheu.gov.hk/b5/info/2plus3_12.htm>. One serving of milk and alternatives is equivalent to one cup (240 ml) of milk, one pot (150 g) of low-fat plain yogurt, or two slices of low-fat cheese. "Bone Development in Young People" International Osteoporosis Foundation, Web. "Nutrition" International Osteoporosis Foundation, Web. <https://www.iofbonehealth.org/nutrition>. “Osteoporosis: Peak Bone Mass in Women" NIH Osteoporosis and Related Bone Diseases National Resource Center, Web. <https://www.bones.nih.gov/health-info/bone/osteoporosis/bone-mass>. "Two keys to strong bones: Calcium and Vitamin D" Harvard Health Publishing, Harvard Medical School, Web. <https://www.health.harvard.edu/womens-health/two-keys-to-strong-bones-calcium-and-vitamin-d>. "Why does childhood overweight and obesity matter?" World Health Organization, Web. <http://www.who.int/dietphysicalactivity/childhood_consequences/en/>. “Overweight and Obesity”, Centre for Health Protection, Department of Health, HKSAR. Web. <https://www.chp.gov.hk/tc/statistics/data/10/757/5513.html>. According to the results of the survey, parent respondents observed that apart from of physical education class at school, their children spent an average of 66.4 minutes per week on exercise and an average of 220.9 minutes per day on electronic devices for leisure, which is equivalent to an average of 1546.3 minutes on this per week, which was 23.2 times more than the time they spent physical exercise. According to the results of the survey, parent respondents spent an average of 64.8 minutes per week on exercise, but spent an average of 409.5 minutes per day on electronic devices for leisure, which is equivalent to an average of 2866.5 minutes on this per week, which was 44.2 times more than the time they spent doing exercise. "Falls" World Health Organization, Web. <http://www.who.int/news-room/fact-sheets/detail/falls>. "Older Adult Fall Prevention" Centers for Disease Control and Prevention, Web. <https://www.cdc.gov/media/dpk/healthy-living/injury-falls-older-adults/older-adult-falls.html>.